Frank Simosik and Michele Larkins Simosik of Phoenixville, Chester County, have had to endure some tough times over the last two years. But they can enjoy peaceful respites from life’s challenges thanks to their beautiful backyard patio, the construction of which was made possible by the generosity of two area businesses. Rinox Inc., a Douglass Township (Berks County) manufacturer of concrete paving stones and other masonry products, donated all of the materials for the project. 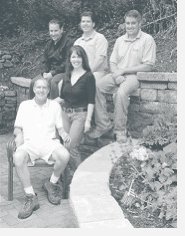 Forcine Wall & Patio Inc. of West Chester installed the couple’s outdoor sanctuary at a generous discount. The patio, which was completed June 2, was a major source of joy for the Simosiks in the midst of much stress and uncertainty. On Memorial Day weekend of 2004, the interior of Frank’s home was destroyed by an electrical fire. Frank, with the help of Michele, whom he had been dating for about three years, spent lots of time restoring the inside of his 19th-century stone farmhouse. By the fall of 2005, things were looking up as the couple was preparing for a November wedding. But three weeks before the wedding, Frank thought something might be wrong when he found a lump on his throat while shaving. His family doctor thought it was the result of an infection. But when treatment for an infection failed to remove the lump, a biopsy was ordered. Frank, 50, underwent a biopsy after returning from his honeymoon. Days later the couple received the devastating news that Frank had throat cancer. To combat the disease, Frank has undergone surgical procedures and powerful doses of chemotherapy and radiation. The grueling battle forced him to take an extended leave of absence from his job as an account executive with AT&T. Michele took leave from her job as an interior designer with Ethan Allen in King of Prussia to care for her husband. Because they were out of work and had already invested so much money into restoring their home, the Simosiks were all set to give up their dream of having a patio in 2006. But Frank’s longtime friend, Andrew Edsall of Phoenixville, refused to let that happen. Edsall asked his employer for help in getting Frank his patio. Sympathizing with the Simosiks’ situation, company co-owners Blaise Forcine and Dennis Ressel agreed to build the patio at a discount, which essentially cut the installation price in half. Edsall also solicited help from Rinox, which has worked with Forcine in the past. Rinox donated more than $12,000 worth of materials for the project. “We thought it was a good opportunity to give back to the community,” said Rinox general manager Ira C. Vosper. The Simosiks were overwhelmed by the generosity of the two companies and Edsall’s determined efforts to give them comfort in their time of need. “He went above and beyond the call of friendship,” said Frank of his good friend. The Simosiks are thoroughly enjoying their 1,200-square-foot, two-tiered patio, which took about two weeks to build. “It gives me a place to go and just reflect,” Frank said. Frank can spend time reflecting on the best news he has heard in months. In the latter part of June, tests revealed that he is cancer free.